California Vizsla Rescue View other Vizslas for adoption. 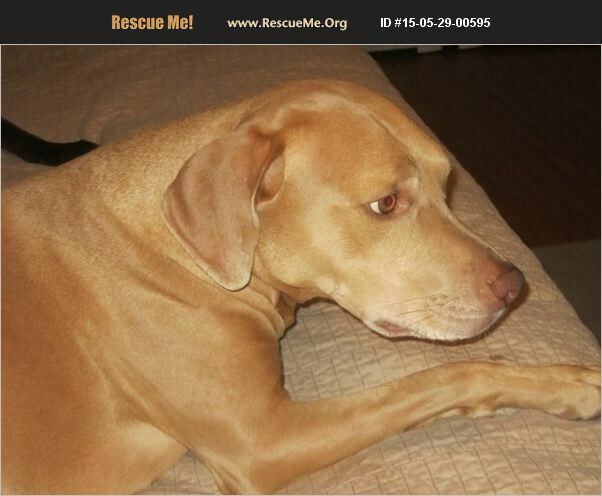 ***Sorry, we cannot adopt outside of Southern California*** If interested in Simon please inquire to bayless584@gmail.com: 4-year old, male, Vizsla/Lab mix, 60-lb. Simon spent the first 10-months of his life with an abusive and cruel human. This poor boy had a broken leg that was untreated, but the leg has healed and he is now getting plenty of love. Simon was rescued by a Florida rescue group and moved to California with his foster family. In Florida, he had the help of some of the best dog behaviorist in the area including Cesar Milan, and has made amazing progress. He has become a loving, happy, and well-behaved boy, but still with a lot of energy. This fellow is only missing one thing, his forever home. This beautiful boy would do great in a home with adults or older children. He is good with other dogs (not sure about cats since his foster people don't have cats). Simon is one smart boy who needs exercise and an active home; he loves to play. His first human put him through hell but he still loves people and wants to please his person. Simon needs an experienced and patient human who can teach him the behaviors he needs. He is a super sweet boy. He would do great with someone who runs or would allow Simon to have an active lifestyle. He can climb fences and would need protection and supervision when outside. Simon is neutered, has a microchip, and all shots. This sweet boy deserves the safety and love of a permanent home where he will get only love.